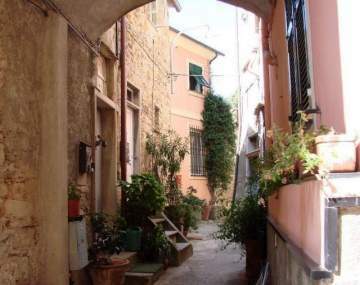 This apartment is located at only 100 m from the beach in Levanto. Levanto has a beautiful historic center with many beautifully painted houses, a nice Wednesday market and a wide choice of restaurants, cafes and shops. There is a swimming pool and diving center on the beach. It is possible to rent boats, pedal boats, canoes and surfboards here. Levanto is an ideal location, especially for surfers. In the good 'surf weather' surfers come from all across Europe showcase their prowess - simply spectacular! A good time to visit Levanto is during the second half of July. Good weather is ensured and the Feast of San Giacomo (23-24-25 July) guarantees plenty of fun with its medieval scenes, thrilling torchlight rides through the city at night, fireworks on the beach, fair and music events. The cozy town of Levanto has a wonderful Mediterranean atmosphere. With all the wonderful bays situated along the Riviera del Ponente, you are sure to have a fantastic holiday! This is an exceptionally well-preserved part of the Italian Riviera. You can enjoy your holiday in the sun, sea and sand or take splendid walks through the beautiful scenery on your way to visit quaint villages and towns in the area. Levanto, with its many wine bars, restaurants and even a spa, is a really pleasant place. Of course you can not skip a visit to the famous Cinque Terre! These five pastel-colored fishing villages on UNESCO's World Heritage list are situated atop the cliffs and are inaccessible by car, thus they have remained very authentic. You can visit these places by train or on foot. A visit to the port city of Genoa is also very worthwhile. Or how about a day in Tuscany? You can enjoy Liguria in so many ways! Apartment in central position about 100 meters from the beach, on the ground floor. Consists of twin bedroom, bathroom with shower and washing machine, living room with mobile-single bed and kitchen area, TV. Modern & nicely furnished. With heating. -bed and bath linen (to hire) 10 Euro /person/change. -consumption (gas,water, electricity): 25 eur/pers/week (children under 2 years old no fee is required). Parking is not free in Levanto. So if there is no parking at your cottage, we advise purchasing an unlimited parking ticket upon arrival, this way you can park anywhere in Levanto. The tourist office sells parking tickets. -Garage 130 Euro / week. -Parking in the reserved parking area (outside) costs: 105 eur/week. As there is a high demand and a limited availability, PLEASE ASK FOR AVAILABILITY! before confirming the reservation.